There’s nothing uppity about my upline. This card was given to me by Deb Kemp. I love the simplicity of it. So elegant!! 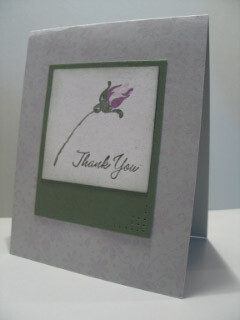 The card is made with Sahara Sand cardstock that’s stamped with Garden Annuals standard wheel and Pale Plum ink. The center part of the card is Confetti Cream on Always Artichoke cardstock. She used Wild Rose stamp set with Always Artichoke, Pale Plum, and Perfect Plum ink. Edges of Confetti Cream are sponged with Always Artichoke ink. Love the paper piercing detail…balances the card and draws the eye up to sentiment. Sentiment from Warmest Regards Level 1 Hostess Set. Thank you Deb for the card! After becoming a demo 2 years ago, this craft area was created. At the time, it was perfect — right off my kitchen so I could have my stuff handy and still be near the area where the family lingers constantly. 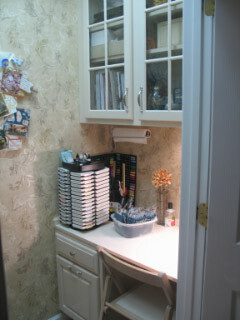 We transformed our butler’s pantry to a small retreat. I now consider it the storage area for all my goods. 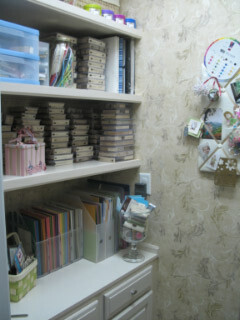 I migrate away from this area to my kitchen to create. So, with my projects always placed around the kitchen (and many warnings to my kids NOT TO TOUCH ANYTHING), I am happy to say that I have a bigger & better craft area under construction. I will be upset to be moving from a central location in my home, but I soooo need much more room. I had to prove to my husband that this was more than a hobby. It is a love of mine! Enjoy the pics. This oldie but goody stamp set (Pocket Fun) is on the list to go bye-bye soon. I just ordered it at the end of April after attending regionals and seeing some “Wow!” techniques demonstrated with the set. Like many, I came home and had to order it. I loved how I could use it for both my daughter and son. After seeing Beate’s weekend Sketch challenge #7, I got the set out, cut & mounted it, and started playing. Okay! So simple is something I’m working on. I have trouble with keepin’ it simple! This is a standard 4 1/4″ x 5 1/2″ card. The card and pocket are made with Brocade Blue cardstock. I used Linen BGwith Brocade Blue ink. I then used my color spritzer tool and added Brocade Blue and Bleach (with old blender pen) to make a more realistic “jean” appearance. The strip is a 1″ x 4″ piece of Certainly Celery. With Basic Black cardstock & my small corner rounder, I created my scalloped edging for the strip and for along the top of the card. I used a Basic Black Stampin’ Write Marker and my best friend, the handy Stamp-A-Ma-Jig, for the sentiment. The girls were just soooo much fun. Colored in with Aqua Painter. Used an exacto knife to the base of arms/hands to give the illusion that they are really poppin’ out of the pocket and resting on the edge. The flowers & leaves were stamped on Whisper White cardstock using Stazon. I used an Aqua Painter again with Orchid Opulence, Certainly Celery, and Pixie Pink. Also punched out a small assortment of Orchid Opulence & Pixie Pink flowers with the spring bouquet flower punch and attached to card using Ice Circles Rhinestone Brads. Added silver eyelets to top of pocket again to add the realistic factor. Sponged Certainly Celery & Basic Black to egde of 4″ x 5 1/4″ base piece of Whisper White cardstock. One month to go till I attend my first SU! convention. It is going to be a really special trip for me because of being one of the Artisan Award winners. As some of you may know, one of the perks to winning is a dinner with Shelli. I received my invite today. This is a hand-stamped invite where they used Baroque Motifs. I keep putting off getting this set, but I think I’m convinced that it is a “must have”. This is my entry for Beate’s weekend challenge #6. The card is a Circle Card. This was definitely a challenge for me because Beate’s card had the flat part of the card to the left and opening to the right (like most cards do). I had this card flower layout in my head for some time and when I saw the flat edge and circle theme, I had to turn my card a different way. 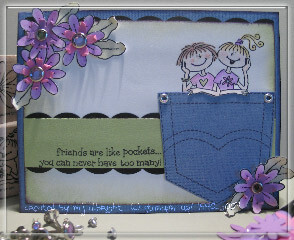 I used Double-Line Doodles and Canvas BG Stamps on this entry. Color combo I used are: Chocolate Chip, Wild Wasabi, Soft Sky, Pumpkin Pie, and Barely Banana. Pierced the paper to continue the circular theme within the card front design. Added On Board Blossoms & Basics and Earth Elements Colored Buttons to give the flowers a wow! effect. I just love how this card turned out. This is my entry for Beate’s weekend sketch challenge #5. This is a Gate Fold Card meaning that it opens from the middle. The main middle square is attached to the right card front flap. It is kept closed by a chipboard petal from On Board Blossoms & Basics on the left card front flap. The stamp set is Zoofari which is very fun to work with. I used a paper crimper and my paper snips to create the grass on the bottom of the card which is behind a strip of stamped & pierced chipboard. Added faux-stitching to the border to draw the eye in to the middle. Did mask the cheetah/leopard (??) with the zebra behind it. All of the heads pop out at you due to having stampin’ dimensionals behind them (images where stamped, colored, cut out, and placed over existing stamped animal heads).